What to do: Try swapping respective components between the two channels and see if the problem changes sides, from left to right. When it does, you've found the defective component. For instance, you could swap the speakers between channels: if the problem moves to the other side (i.e. the same speaker that was dead before is still dead, now that it's connected to the right channel cable) then you know that speaker is bad. If the problem stays on the same side (i.e. the speaker formerly silent is now producing sound after having been moved to the other side of the room and connected to the other cable), then you know the speakers are fine, and the problem must lie somewhere else (perhaps in the cable connecting the silent speaker to the amplifier, or in the amplifier itself). Suppose that someone were building a custom automobile. He or she would be foolish to bolt all the parts together without checking and testing components and subsystems as they went along, expecting everything to work perfectly after it's all assembled. Ideally, the builder would check the proper operation of components along the way through the construction process: start and tune the engine before it's connected to the drivetrain, check for wiring problems before all the cover panels are put in place, check the brake system in the driveway before taking it out on the road, etc. 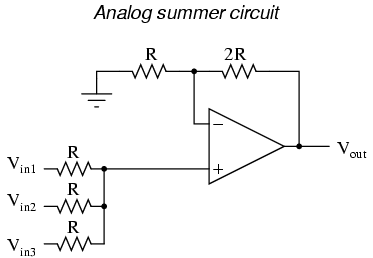 Take the example of the analog summer circuit in the previous section for example: what if it wasn't working properly? How would you simplify it and test it in stages? Well, you could reconnect the op-amp as a basic comparator and see if it's responsive to differential input voltages, and/or connect it as a voltage follower (buffer) and see if it outputs the same analog voltage as what is input. If it doesn't perform these simple functions, it will never perform its function in the summer circuit! By stripping away the complexity of the summer circuit, paring it down to an (almost) bare op-amp, you can test that component's functionality and then build from there (add resistor feedback and check for voltage amplification, then add input resistors and check for voltage summing), checking for expected results along the way. Example #1: A turbine control system shuts automatically in response to an abnormal condition. By the time a technician arrives at the scene to survey the turbine's condition, however, everything is in a "down" state and it's impossible to tell what signal or condition was responsible for the initial shutdown, as all operating parameters are now "abnormal." Finger-pointing. It is all too easy to blame a problem on someone else, for reasons of ignorance, pride, laziness, or some other unfortunate facet of human nature. When the responsibility for system maintenance is divided into departments or work crews, troubleshooting efforts are often hindered by blame cast between groups. "It's a mechanical problem . . . it's an electrical problem . . . it's an instrument problem . . ." ad infinitum, ad nauseum, is all too common in the workplace. I have found that a positive attitude does more to quench the fires of blame than anything else.